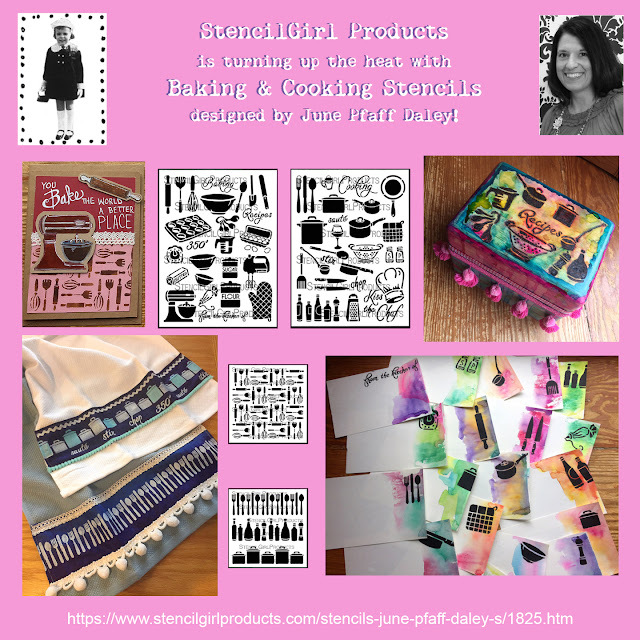 StencilGirl is serving up new stencils by June Pfaff Daley and Jamie Fingal. Jamie loves to create a sense of beauty and is intrigued by nature. Enjoy the garden path, where the leaves and long flowing lines of the lattice shelter the new seedlings in her Leaf Zen Landscape Stencil. 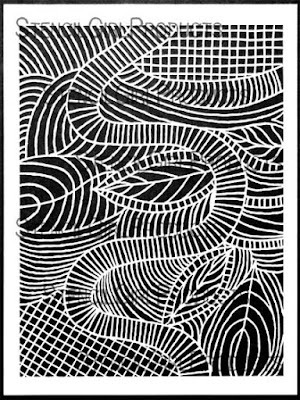 Jamie has created an enlargement of the original 6" x 6" version of Zen Landscape with flowing lines, elongated leaves, and the winding path leading you to where ever you want to go in the secret garden of life. 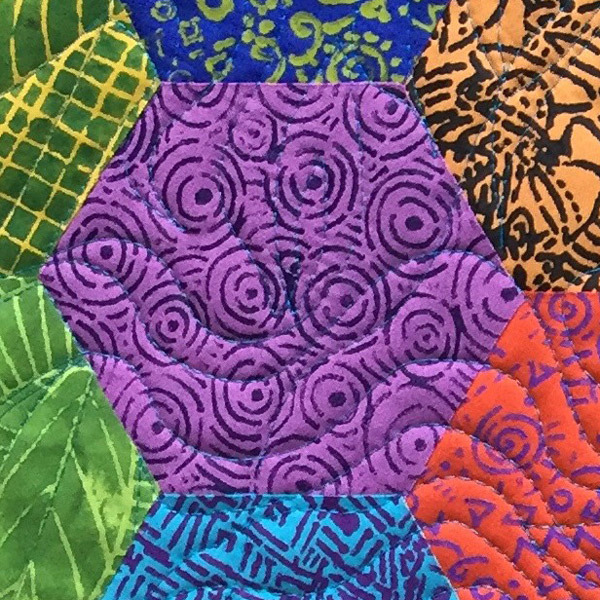 Jamie Fingal is a quilter. 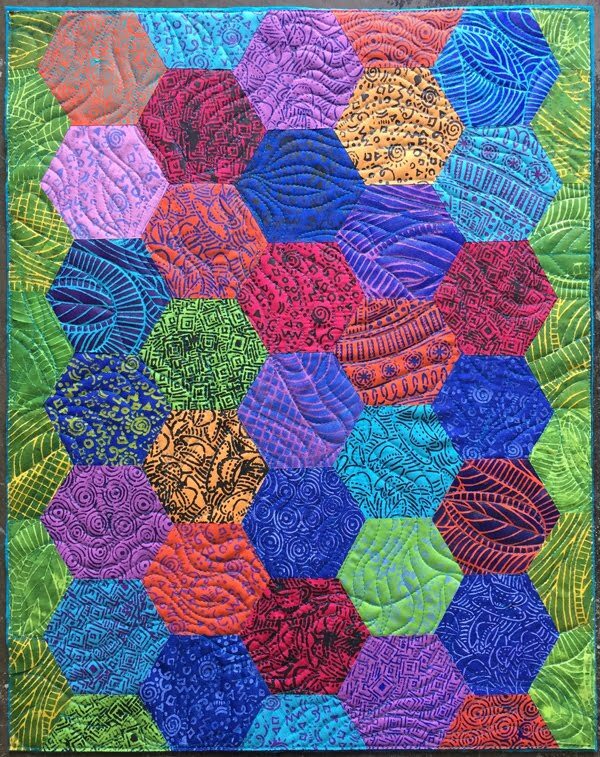 Her Organic Zen Stitched Stencil is all about stitches, lines, patterns and whimsical quilting motifs. 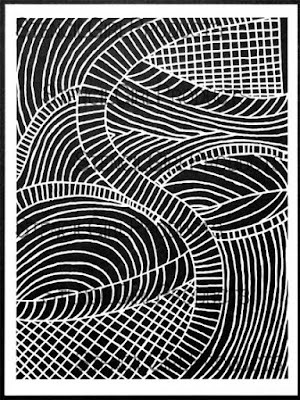 This stencil can be used in portions to create texture or as a whole design. 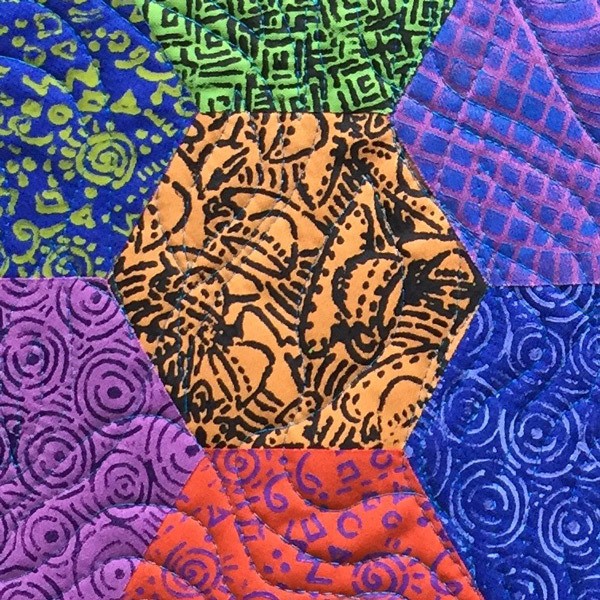 Quilt with paint! 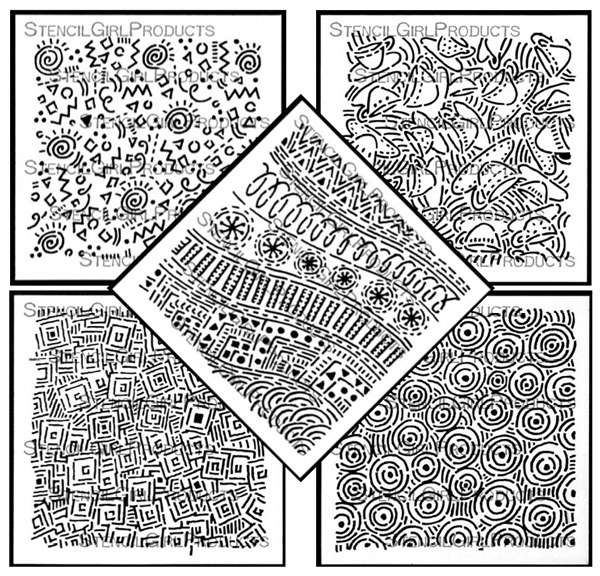 The Organic Zen Celebrate Stencil features some of Jamie‘s favorite doodles to make backgrounds to jazz up an object, and to celebrate joy. 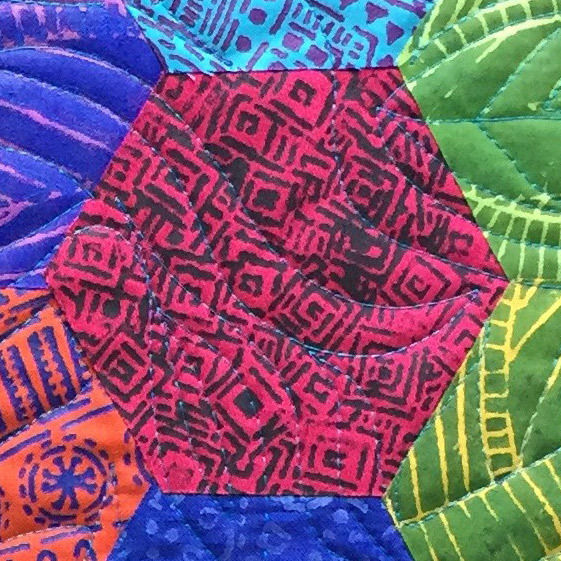 Spirals, triangles, squares and circles light up our world in fun and whimsy. One of Jamie Fingal's signature motifs in her artwork is a cup and saucer. The Zen of Cups and Saucers Stencil, whether it be filled coffee, chocolate, or tea, will delight all connoisseurs. Cheers to the Zen of a delicious cup of soothing goodness! The Organic Zen Squares Stencil features a metric chance of squares intertwined with one another. 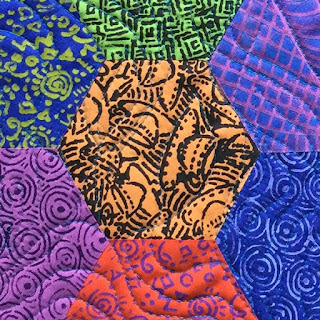 Jamie has a quarter and a square is the basis of many quilting blocks. 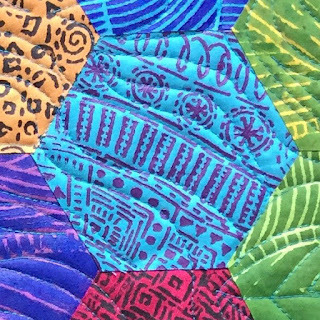 Squares add texture to backgrounds and objects. Organic Zen Circles features Jamie’s organic vision of water, puddles, skipping rocks, ocean and watching lovely rain drops fall into the water. It also makes for a whimsical sky. 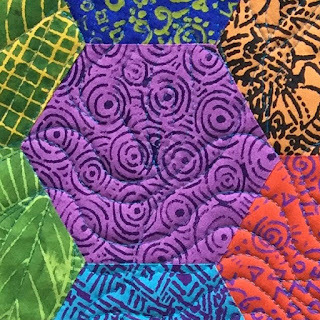 Just look at this amazing quilt Jamie made with her new stencils! 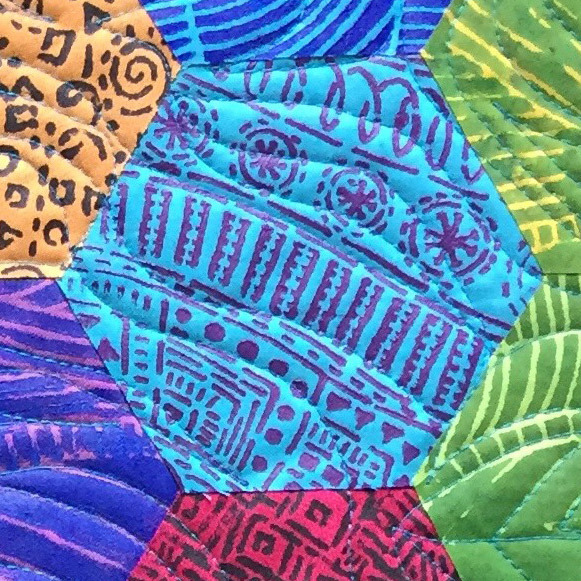 She's written a post on her website too! 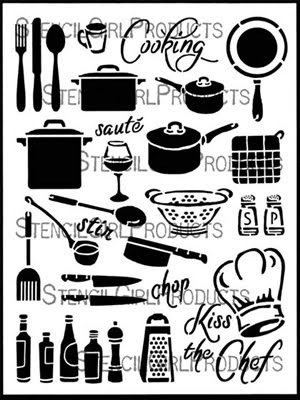 Mothers Day is May 13th and if your mom, grandmother, aunt or the special gal in your life likes to cook or bake, these are the stencils to complete some unique projects. 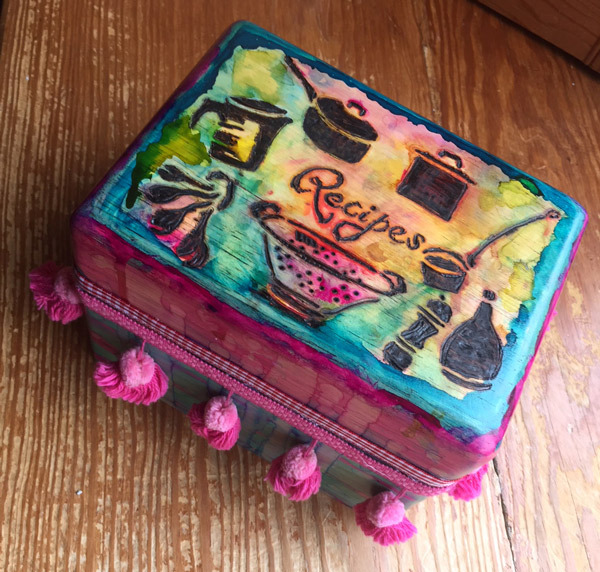 Materials: wooden recipe box (I found mine at the thrift store); wood burning tools; Baking Stencil; alcohol inks; pencil; plain plain 4” x 6” note cards; watercolors; stencil brush; paint brush; ribbon; pom-pom trim; hot glue. 1) Use a pencil to trace the stencil designs on the plain wooden box. Wood burn the designs into the box with appropriate wood burning tools. 2) Paint various alcohol inks directly on the wooden box. Use plain rubbing alcohol to remove any unwanted paint or use as a resist to get some cool effects. Let dry. Spray with sealant if desired. 3) Attach trim with hot glue as desired. 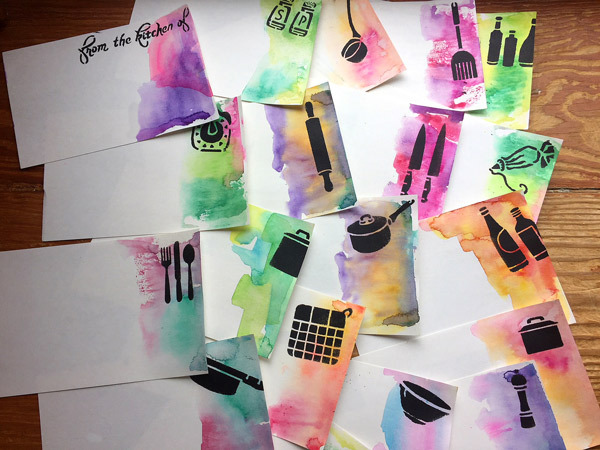 1) Using water color and a paint brush Paint the corners of the cards with a light wash using 1-3 colors. Let dry. 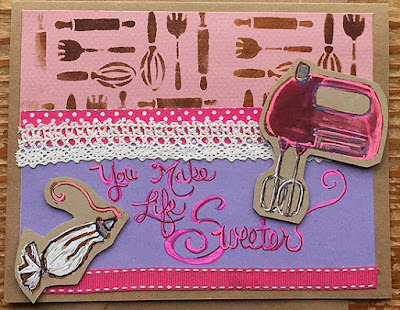 2) With a stencil brush, stencil a cooking/baking icon in the upper right hand corner of the card. I used black paint. Let dry. 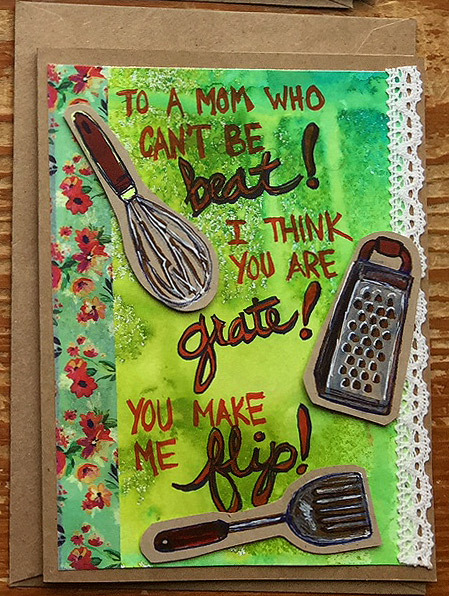 3) The card is ready for a recipe. File away in your gorgeous recipe box. 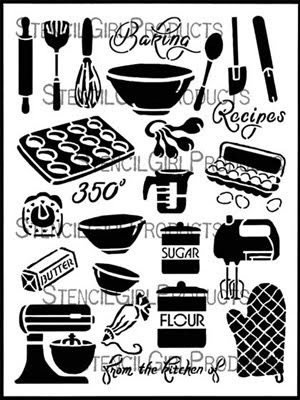 Baking Utensils Repeat Stencil and Cooking Borders Stencil, each are 6" x 6"
Materials: plain dishtowels; cotton fabric; trim; fabric paint; Cooking Borders Stencil; stencil brush; scissors; sewing machine. 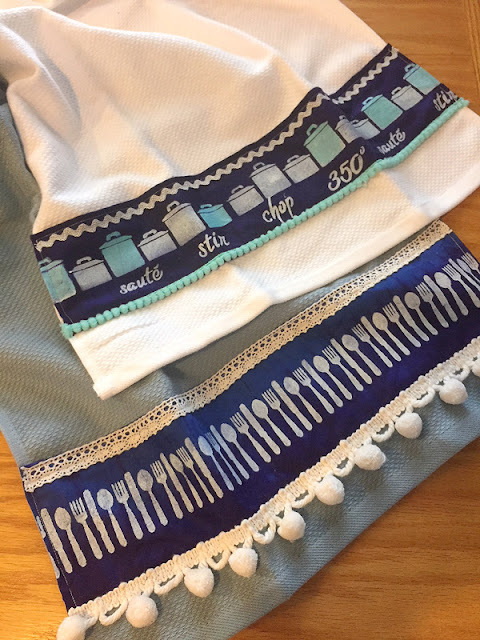 1) Measure the width of your dishtowel. Add 1/2”to this measurement. The stenciled fabric band will be approximately 4” x dishtowel width + 1/2”. Stencil your design in the middle of the band with fabric paint and a stencil brush. Let dry. 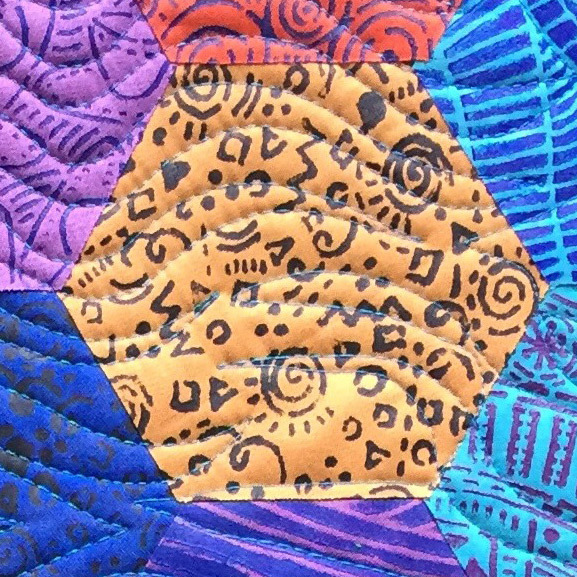 3) Sew on desired trim. 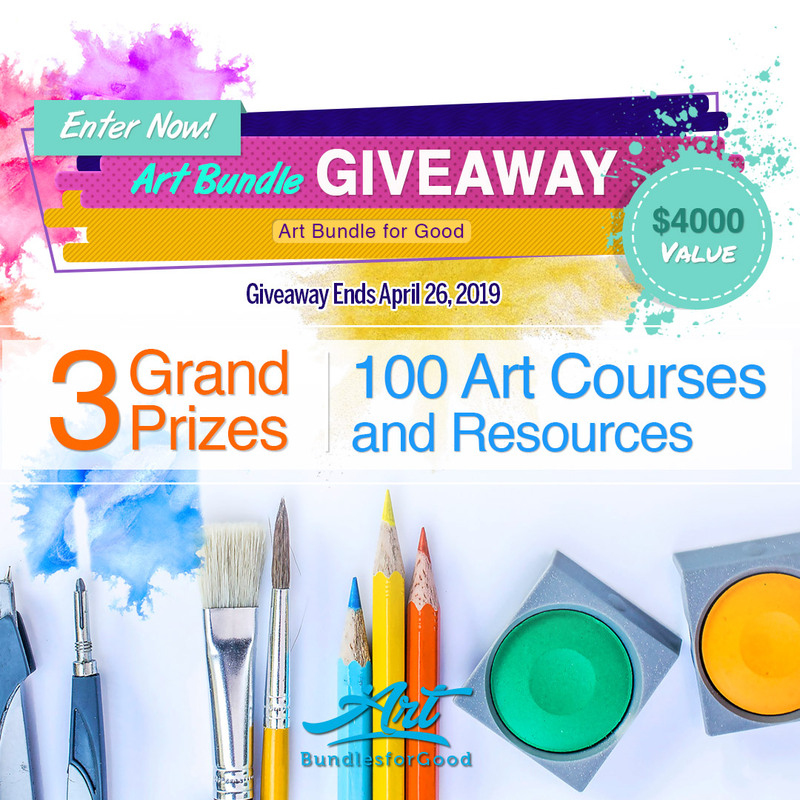 Materials: plain cards with envelopes; cardstock; Baking and Cooking Stencils; paint; gelly roll pens; adhesive; washi tape; stencil brush; 3D-dots; decorative brads; ribbon; sticker letters; scissors; etc. 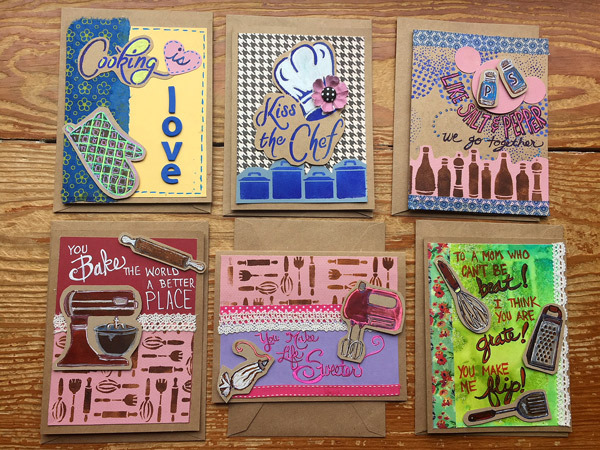 1) Stencil a bunch of cooking and baking images on a heavy cardstock with a burnt umber or similar colored paint. Let dry. 2) Cut out your images. 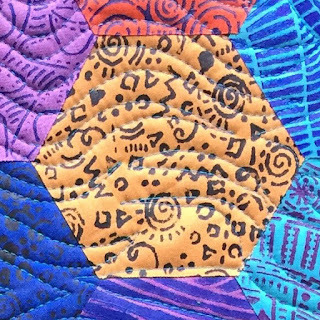 Using a combo of paint and gelly roll pens add color to the stenciled designs. 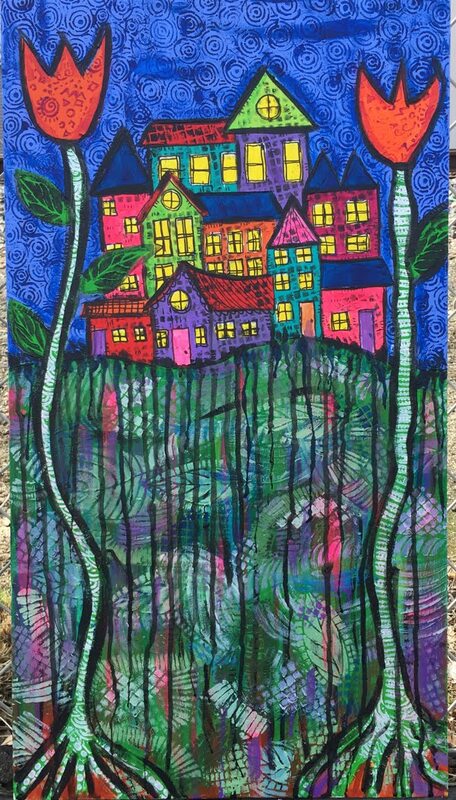 3) Using the repeat 6” x 6” stencils create some larger paper sheets with paint and a stencil brush to use for backgrounds and borders. 4) Arrange your elements on the front of a plain card. Feel free to use my cards for ideas. 5) Adhere elements to card. 6) Add a sentiment with letter stickers, stamps, stencils or your own handwriting. 7) Gift your card to a special someone. 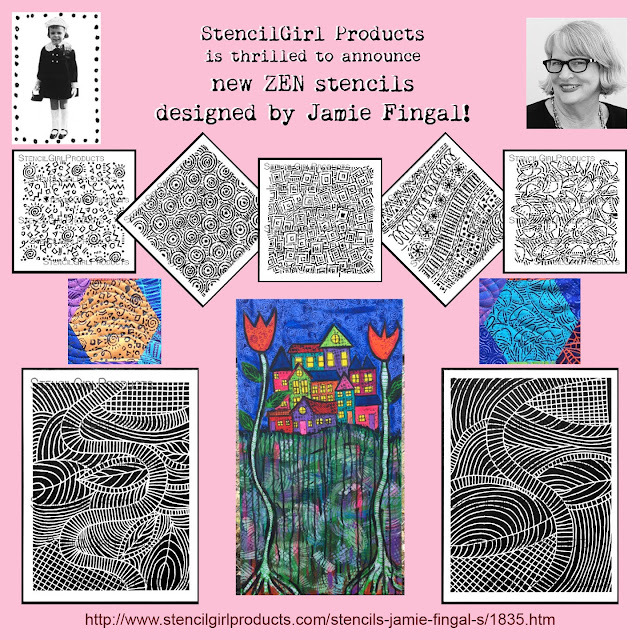 You can find all of June Pfaff Daley's stencils HERE and Jamie Fingal's HERE.